Delray Rawlins and his Sussex’s teammates will have an extra incentive to clear the boundary rope at The 1st Central County Ground this season. For every six that they hit into the brand-new Cow Corner hospitality area during this summer’s T20 and one-day competitions, Cow Corner Investments will donate £1,000 to the Sussex Cricket Foundation to support its aim of actively changing lives through cricket across the county. 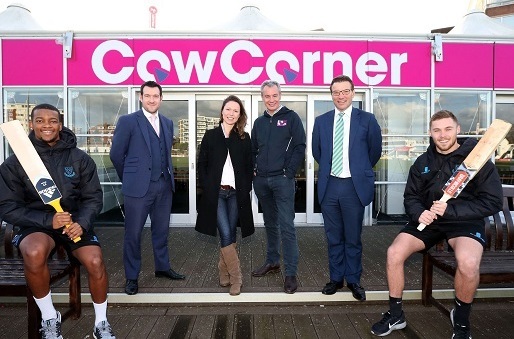 Sussex Cricket’s head of community cricket, Chris Coleman added: ““We are delighted that, as well as their sponsorship of the club’s hospitality area, Cow Corner have extended their support to work with the Sussex Cricket Foundation. “Their donations will be directly invested into community programmes to help change lives through cricket. It’s a further example of Sussex Cricket working as one organization.